"Who loves a garden loves a greenhouse too." 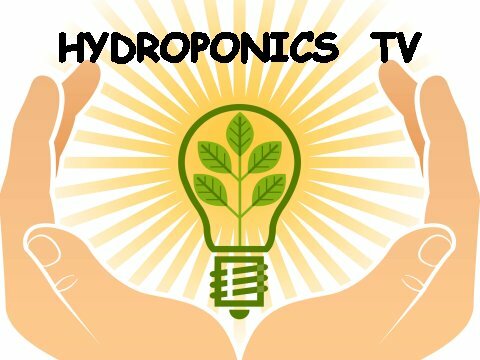 What's Going on at Hydroponics-Simplified? You certainly must have noticed a new header (logo). How about that? Do you like it? Well we do, and had a lot of fun making it. If you look at the vine very carefully you will notice two nonfood items hanging from it (just for fun but appropriate). You may have also noticed a fresh new look to our pages, with bold new section headings and information boxes. We're in the process of giving the entire website a face lift, so bear with us while some pages are finished and others are not. However, all the really important and cool information is still in there. And we are getting together some fresh new pages, so please visit often. Should you flush your garden? Actually, yes you should! Of course this only applies to plants involving pots, not the lettuce raft or NFT systems. Flushing is the process of washing out unwanted minerals, chemicals and deposits from your hydroponic system. 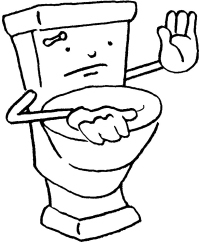 Flushing removes accumulated buildup of salts, helping to achieve healthier plant growth. 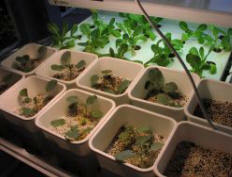 Excessive salt buildup is an all-too-common problem that affects millions of hydroponic gardens. Minimal amounts of salt is perfectly fine, but as it begins to accumulate your plants will slowly begin to suffer. Unless you take the necessary actions to fix it, excessive salt buildup in your hydroponic system will likely kill your plants. The good news is that flushing your system easily removes the salt buildup, getting your plants back to their healthy state. Some people may attempt to rid the salt using various other methods, or pay for specialty hydroponic flushes, but there’s no better or easier way to remove salt buildups than by flushing your system with clear, pH-balanced water. Wait until you are ready for a nutrient change-out. Prepare several gallons of clean water and balance the pH to 5.5-6.5. Make sure it is at room temperature, as very cold or hot water will shock your plants. Drain your nutrient solution as you normally would; however, at that time gently flush the top of your pots with the clear water so that it drains into your nutrient vat. Drain away all flush water then mix a new batch of nutrient solution and proceed. That's all there is to it. Taking this precaution at every nutrient change will help ensure a healthy garden.